If you've ever seen a jellyfish washed up on the beach, chances are it was a moon jellyfish. Also called the common jellyfish or the saucer jellyfish, this sea creature provides a fascinating show with its gently pulsing bell-shaped body in coastal areas around the world. The moon jellyfish's beauty is offset by the menacing tentacles that can pack a powerful sting for unwary swimmers. 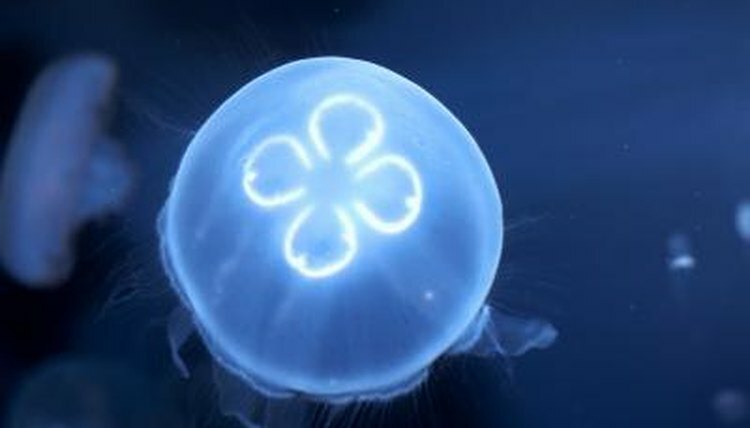 Moon jellyfish (Aurelia aurita) are native to coastal waters around the world, mostly the Atlantic, Pacific and Indian oceans. They are most common on the coasts of North America and Europe, where the water stays near their favorite temperatures for much of the year. The shallowness of coastal areas gives jellyfish easy access to their favorite prey -- zooplankton -- and offers a safe haven for their young. The moon jellyfish prefers temperate water that falls between 48 and 66 degrees Fahrenheit. These hardy creatures can survive in other water temperatures, though, ranging from 21 to 88 degrees. This gives them the ability to live in areas with cold winters, such as the East Coast of the United States, as well as those that are warmer all year, such as the tropics. Moon jellyfish live beyond the ocean. You can find them in the brackish water where freshwater and saltwater mix, such as in estuaries and bays. They often look flat in brackish water, as salinity helps them maintain their rounded bell-like appearance. Moon jellyfish have been known to survive even in freshwater lakes. Moon jellyfish like to swim in many of the same areas humans do -- close to the beach. Jellyfish stings are not uncommon. While they're typically not fatal, stings can be painful for days. Even jellyfish that have washed onto the beach can sting you if you touch their tentacles; they're not strong swimmers, so it's common to see them on the shoreline. In the waterjellyfish tentacles can touch you before you see one of the creatures, which are nearly transparent. Moon jellyfish tend to travel in large groups and swim with their bodies near the water's surface, making it difficult to avoid a sting if you become surrounded by jellyfish.